Snail Poems is an elegy for both a lost friend and a fading ecosystem, personal tragedy and capitalistic fallout. The book takes as its thematic and rhetorical vessel the snail, small, fragile, and surprisingly unknowable. The Braid is a document of pregnancy and early parenting within a world of political surveillance and the police state. It focuses on that which is possible and impossible as a white woman parent in a capitalistic and violent United States. Gabriel Ojeda-Sague: Thanks, you two, for taking time to talk with me. It’s great to have you here and welcome your books into the world. As I’ve been reading The Braid and Snail Poems, I noticed a way in which both books are altering the now-cliché phrase “the personal is political” into something I’ve been thinking of as “the personal is environmental.” Maybe that’s not the best version of the phrase, but what I mean is, both books are invested in seeing the personal as defined by what is around you, politically, socially, and ecologically. Why might that view of the personal be useful to your projects of activism and grief? Eric Sneathen: Can I write until I figure this out? It’s a lovely question. For me, Snail Poems is trying to figure out its environment, by which I mean it’s pointing to something like the local or the proximate, an area of influence, an atmosphere. I identify strongly with a local ecosystem of writers and influences situated and originating in the Bay Area (New Narrative writer Kevin Killian secured my first reading in the Bay, opening for him at Woolsey Heights), so Snail Poems might be an exploration of how I’m a part of, or influenced by, the writing and the events that are happening here. But more importantly, and I think the poems in the book are rather explicit about this, I’m not sure where to locate my grief, my experience, my friend. She died while we were in the United States Peace Corps in Morocco, and I wrote to her on the other side of the Atlas Mountains, the other side of the Atlantic, and now the Pacific. Again, where is the scene of poetry, of my anger at the conditions of her end? And the anxiety about mattering persists alongside this — which deaths are lamentable and significant, which are not? This becomes a theme in the book, especially in the final portion, where my grief pursues me from Morocco to graduate school to my home here in Oakland. Lauren Levin: My thoughts are going in so many directions, but I’ll give it a try. One thing to note is that my book started for me in an experience of crisis in a realm often seen as apolitical or prepolitical. That is, I got pregnant, and I had an intense experience of what’s called “postpartum depression,” which I learned for half of women starts during pregnancy, which was the case for me. And this “depression” more commonly manifests as anxiety, which was also the case for me. So severe anxiety, which persisted after my daughter was born, and flourished in a space where there are pretty strong cultural constraints against it. I was “supposed” to be happy. (My favorite version of this was when I was pregnant and people would say “Don’t worry so much, it’s bad for the baby.” Thanks!) Anyway, I could go on about this forever, but I think a different way of saying “the personal is political” is saying “there is no outside to politics,” which means there is also no outside to activism or grief. No grief that should be made insignificant. (I love the work your book does in that realm, Eric.) In that sense “the personal is political,” AKA the personal is structured by systems of power, is still an important insight. Especially since the political as such has always been envisioned as the opposite of the personal (the feminized, the insignificant, the domestic). I was pursuing that insight through my book: like, trying to learn it for myself. What the political sources and meanings of my anxiety might be, its relationships. Appropriately, my daughter (she’s three) just climbed into bed with me. Ojeda-Sague: I have follow-up questions for both of you, but I think I’ll start with a follow-up to what Eric is saying. Eric, in Snail Poems there is a line that reads “I teach kids what we miss when we miss / truffula trees” which has stood out to me as a line that helps me embody the environmental-personal that I’m seeing in both books. Does “what we miss when we miss truffula trees” include the kinds of crises and systems of power that Lauren is describing? Sneathen: Truffula trees are perhaps, stupidly, a central part of my sentimental education. Dr. Seuss’s eco-fable, The Lorax, just makes environmental catastrophe and its reversibility appear so clear and delightful. At the end of the day, a seed falls from the storyteller’s tower, an answer to what’s missing: go plant this tree, we can pull back into history, into another dazzlingly bright moment. It’s rather terrifying to think that this regressive vision rings so true for our own political moment, the stepping back to have things be the way they were. What if Trump is that evil capitalist in The Lorax who learns the lesson after he’s blown the beautiful world to bits? I think Snail Poems is after weird juxtapositions like that. But, yes, back to the memory of truffula trees, at the end of the story, they’re gone. How do we feel that and teach that loss and hold it and shape it, not just for ourselves and our grief, but as something potentially antagonizing that we can move and mobilize in others? That’s a question. Also, behind the curtain a bit, when I was in Morocco in the Peace Corps, I would often have to answer for myself, what are you doing here? And I would give answers like, I teach kids to “x.” One of those x’s was an environmental leadership camp, where I had The Lorax translated into Moroccan Arabic. So it’s a bit of real life in there too. Ojeda-Sague: The stakes you are laying out here, Eric, seem very similar to the stakes of The Braid. When I was reading Snail Poems, I got the impression that you were offering a reprieve from the crisis you were working from, and I thought that reprieve was in friendship. You say “We help one another move and be moved. Friendship is a thing we hold up to those who would annihilate us and our imaginations.” Lauren, my question for you would be: do you see The Braid as also offering some form of reprieve or “way out,” or are you more interested in defining the stakes, or in saying there is no “out?” I have one idea of what the answer might be, but I’d love to hear yours. Levin: This is a tough one. I’ll start by jumping back into Eric’s beautiful answer. It occurred to me that there’s an analogue to planting the truffula tree seed in The Braid. I mention Lord of the Rings (specifically the Return of the King movie) and the trope of solving a problem through a quest: go and throw a ring in a volcano and every kind of crisis is fixed. (Mordor was a kind of environmental crisis, right?) The bad world turns good. It’s a kind of individualizing cultural fable, that there’s a heroic action one takes on one’s own to turn everything around. As a Pisces (not to mention someone who grew up US American, in the capitalist system, etc., etc., etc.) that has a lot of emotional appeal to me. When I’m really struggling I turn to science fiction and fantasy and part of that is because I take comfort in how simplistic they can be about the stakes. (Post-election and post–Ghost Ship I am all about science fiction, the worse, the better.) So there’s definitely a thread in The Braid that critiques that whole idea of a heroic “way out.” But I am also invested in a … something else. Maybe I could also locate it in the vocabulary of science fiction… the ability to imagine what’s not-yet-there. OK, I’m getting myself in a tangle here. Because I want to say that utopian impulse has to be collective, but I think in The Braid I’m also working against heroic theories of friendship a little bit. Because it’s not always so easy or so ethically pure to connect to other people. Like, if the central relationship in The Braid is between parent and child, there’s so much love there, but also a lot of ambivalence, a lot of power dynamics, power struggle, fear of how one person shapes and distorts the other. I wouldn’t want to put the parent-child relation up as a kind of heroic solution, partly because I think that diminishes it. Maybe what I’m trying to think about is, if we take it for granted that there is no reprieve, and that relationships between people are beautiful but also troubled and full of struggle, what can we build together anyway? How to imagine collective struggle that doesn’t try to erase difference. Ojeda-Sague: On this issue of the heroic solution, I want to ask about a line from The Braid which reads, “I feel like if I can handle all the strands in a poem, I will repair the world.” That certainly has a near-heroic vibe, but I’m always interested in this, especially as a poet myself. The age-old question: why write in the face of crisis or catastrophe? I’m sure that you two don’t have the final answer to this. It feels unanswerable. But since we are talking about stakes and solutions, it must be said that both of you wrote a book. That feels like an enacting of some kind of solution. Is this a solving gesture or just, we’re poets and that’s what we do? We make books? Sneathen: It’s an honor, really, that you have read my/our book(s) and these questions have become immediate and urgent as a response. And isn’t that somewhat remarkable, the appearance of those big questions, considering our books talk about things so natural (if we can use such a terrible word): children, parenting, friendship, and snails? The response “poets write poems, that’s what we do” is pretty cute, and one that I appreciate from time to time. But it sure lets art off the hook, doesn’t it? Writing is humiliating and humbling. Of course, no one can actually handle all the strands in the poem — isn’t this part of the humor of The Braid? Coming up against the limits of the strictly personal, what an individual can control and achieve, be it Art or Revolution? The tongue-in-cheek recognition of this kind of hubris returns me to your original question about the personal being political. There are, of course, many ways to think about the personal being political, some of which remain vital and revolutionary (e.g., how the personal is defined and thereby militarized against the social) and some of which are rather banal if not regressive (e.g., buying LED lights at Walmart as environmental activism). Which crises and catastrophes are defined as (merely) personal, which as social, collective, global? The definition of each, the attendant militarization of each definition, language plays a part in that. I never forget that I speak the same language as the president; that tool, that weapon, is the same, even if its deployment is variable, with different consequences, obviously. Poetry partakes in the ongoing mutation of language. Still, I’m not so delusional to think a book will change the world, despite all my work and literature degrees. Why keep writing? I still have hope, even though that’s a totally embarrassing thing to say. Levin: Yeah, I want to point out that the line in The Braid before the one you quoted is “I wrote a poem now I get to go buy bras.” Which makes a poem into a much more quotidian kind of solution. That line, “I feel like if I can handle all the strands in a poem, I will repair the world,” was definitely poking fun at myself and the heroic and totalizing aspirations of poetry. The hubris, as Eric says. But a joke wouldn’t make sense if it didn’t hold some real feeling. So in struggling with these questions, I am drawing on a long Bay Area tradition (which Eric is doing important work on … shoutout to Eric’s upcoming New Narrative conference at Berkeley!). I don’t think I would be able to write without at least a desire, however quixotic, to “take part in the forces that generate the present.” But I also think that writing should be suspicious of itself. Writing this book did a number of things for me. It allowed me to sit with discomfort and to shout myself back into existence at a time when I felt I had disappeared. It allowed me to gnaw on unanswerable questions. It allowed me to try to find language for experience that I had no words for, that I had mostly seen represented as a grab-bag of misogynist tropes and cultural commonplaces (i.e. parenthood). But I didn’t see writing the book as a solving gesture, really. Maybe as an anchoring gesture, trying to root myself in life. But just because I don’t believe in solutions doesn’t mean I’m free of the responsibility to try to work with other people to make things better. That’s where the Jewish tradition of “tikkun olam,” repairing the world and the obligation to try to do that, has always seemed beautiful to me. Ojeda-Sague: Moving towards our final moments here, I want to ask you both a smaller-scale question. Thanks for both taking a quite valiant and impressive effort at the unanswerable and maybe even cliché question of why we write! I love both your responses. Eric, I’ll start with my question for you. I became really interested in your relationship to Mei-mei Berssenbrugge’s Hello, the Roses (one of my favorite books! ), which you use as a source text for your work. If I had to say what connects your books, I think both share a sense of wonder at natural landscapes with an understanding that the natural also rides a line between organic and fantastic, or maybe is hiding even more amazing aspects of itself in an imaginary world. I guess partly I just want to say wow at both your books. But I guess I’ll ask you to talk about how this book might have helped you define how to characterize a “snail” as so much more than, and just exactly as much as, a snail. Sneathen: Thank you, Gabe — that is so kind. Mei-mei Berssenbrugge’s title already does so much, hailing a world that cannot speak back in language like English. Attention, perception, wisdom, pace, beauty: there’s so much to collect and appreciate in that book. Her and Kiki Smith’s Concordance was also on my mind (frogs and toads are repeated in the book as an homage). I’ll have to answer this question obliquely, and in just a second, but I want to say that nesting my practice of reading inside my practice of writing is crucial to how I understand the whole poetry thing to work: perhaps you or someone else can see my bookshelf by reading one of my poems — this is nowhere more explicit in my book than the first poem in my book, “Priamel,” where I have collaged together all the dedications I can find on my boyfriend’s shelf, Elaine Kahn next to Theresa Hak Kyung Cha, CA Conrad next to Jasper Bernes. There’s an analogy I’m going to need to stretch from the micro to the macro, here, the supple and revelatory anticipation of seeing in Berssenbrugge’s writing resonates with my own aspiration to see and hear others in the room. Stephanie Young has a gorgeous and obvious sentence in her book Ursula or University that has stuck with me, something about being in the room with others, reading after reading, is a way of learning how other people lean forward in chairs to hear, to know what makes them laugh or sigh, light up. I have a specific history with snails, including a high school “science experiment,” where I set up snails in shoeboxes in the bathroom, covered them with aluminum foil, each with its own type of food. This history is a coincidence to my friend’s nickname being Snail. So when a few folks have come up to me to say, “I’ll never see a snail the same way again,” I’m touched and stirred by that embarrassing hope I mentioned earlier. Not that people care about snails necessarily, but that other people can change their minds about the world around them, how to perceive it and feel about it, that what was insignificant can suddenly matter as a consequence of something as small as a poem or a reading. Hello, the Roses does that for me, too. Ojeda-Sague: Lauren, I want to ask you about the attention of your book. Reading it, I felt immediately that we were not dealing with anything called “linear thinking,” but something much more “brambly.” Subjects interweave rapidly, sometimes unpredictably. On a stylistic level, if this isn’t linear thinking, what kinds of associations were you most interested in and how did you develop them? Levin: Ha ha, brambly, I like that. I have a maybe painfully simplistic answer to this question, which is that I’m not a linear thinker, and I tend to move sideways. I throw out a bunch of balls of string and then try to chase all of them at once. There’s a way that the practice you notice is much more “naturalistic” for me than following a linear causal chain through a poem. In terms of the associations I was developing, that process was definitely useful for me in connecting personal experience with larger social forces. My friend Jared, on reading some of the early poems in the book, said, “You’re working with the three P’s: pregnancy, prison, and pastoral.” Which feels weird to write, so blunt and schematic, but is true of the book in a way. I was trying to look at this experience of anxiety, and I started thinking about pregnancy, parenting, childhood, my own childhood. I grew up in the Reagan era, so that led me to Reagan’s connections to the police and prison state, and the way authoritarian states use fear and anxiety to secure their power and suppress resistance. I can’t remember how I started thinking about pastoral specifically. Probably some tiny thing that I read that sent me down an endless rabbit-hole! But pastoral was useful in thinking about anxiety. Since pastoral has been a genre of poetry that depicts idealized, calm, peaceful landscapes and worlds, it has been part of art’s role as a depoliticizing force. A force that pretties up or naturalizes the violence of the established order. The image of mother and child staring into each other’s eyes in a space outside time is a kind of pastoral. “Morning in America” is a pastoral, as is the dystopian “Make America Great Again.” At the same time, art as a reparative force is important, I think. Art as a disruptive force is too! But I don’t know what that art, the art that holds both those things, looks like. So I took those threads (Reagan, the pastoral, staring into a baby’s eyes and feeling terrified) and chased them through all the mazes I could find, looking for something, I’m not sure what. Ojeda-Sague: In lieu of a final question, and getting a sense of how your tour went, I want to ask you both what you have learned about the other’s book while on tour, or the way your perspective on it has changed. Levin: The tour was a tremendously moving experience in so many ways: being out in the world so soon after the election, and being in a collective process of grief and mourning and anger with everyone we met. 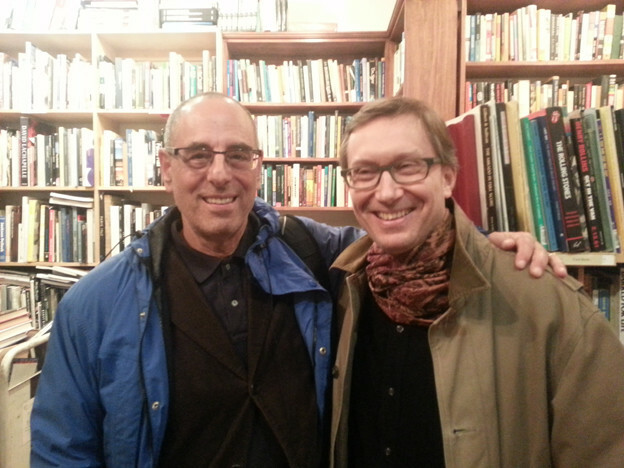 But the most moving part was deepening my relationship with Eric as a person and with his work. It’s hard to put into words all that I learned from Snail Poems. Hearing Eric’s work every night released me from a kind of depressive paralysis I felt immediately after the election. It unfroze me and made me take poetry seriously as a vehicle for feeling, which also made me think about feeling together as a starting point to acting together. Eric’s work so beautifully thinks about devalued creatures: the snail as incredibly fragile and also relentless, persistent. In so thoroughly investigating and feeling-with the snail, the book makes obstinate grief a generative space. It germinates a new set of values: I don’t see snails the same way and I don’t see love, loss, and activism the same way either. There’s an erotics of friendship, erotics of activism, in Snail Poems. Being fueled by the anger of grief, by its love and lust: just to know that that is still possible, right now, is everything. A week ago, my dear friend Em Bohlka died in the Ghost Ship fire. She was an amazing poet and just an incredible person. Everything I’m doing right now feels structured around her absence. So also for that very personal (and very collective) reason I am incredibly grateful for Snail Poems. For the work Eric has done on how to love and mourn a friend and how to incorporate that grief into a social world. I am just absolutely at a loss, but at least Eric’s book is there with me in my sadness. I’m not ready yet to talk about Em, but I know nothing is more important than speaking what she was to me, what all of us are to each other. I want the politics of that. And Eric’s book speaks that language. It’s waiting for me, when I’m ready to use it. Sneathen: What can I say? I first heard Lauren read at the release party for Lana Turner #6, how many years ago now? She read a portion of “The Lens,” one of the longer poems in the book, and my heart and head did all the things her readings always do to me: they warmed up, broke to pieces, challenged themselves to act, to repair, to commit to the direction in which her poems sent me. “The Lens” begins, “But I’m in love with the form being molten,” a line that’s never left my ear, her desire in that poem, striking and infinitely applicable. I gobbled up everything I could of hers — I met Lauren as an idol, as a star! And The Braid has only further cemented my passion for her writing and thinking. We’ll both say this, that despite mutual admiration and some meetings with our publishers about our books, we didn’t know one another intimately before the book tour, its planes, buses, convos, feels, and border crossings. But I have a new accomplice and friend in Lauren, absolutely. Being on tour with Lauren, so soon after the election results especially, I witnessed how incredibly deep a poet could go in their ambivalence and art; her pages are bursting with history, with those little things that make you giggle, or peeved, or violently nod along. After she finished her reading of “The Diamond Skull” each night, I’d look back at the audience, their jaws dropped, blood in their faces. Hers is a voice to heed. I hear her and I think, that’s how much I can pack into a line or a break, that’s how far I’ll need to go next time. 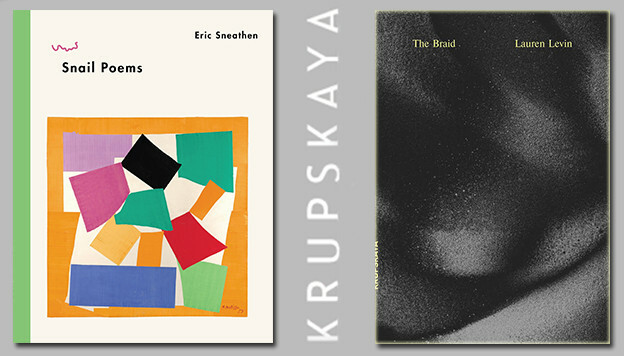 Ojeda-Sague: Thanks again to both of you, Lauren Levin and Eric Sneathen, for talking to me about your Krupskaya books, The Braid and Snail Poems. By the time this interview arrives to the public, it will be 2017, which seems sort of unimaginable right now. I hope that we have all found some ways to heal and develop new relationships in that not-yet-found year. Love to you both.